Learn more about Frida Con Rolos from M. Tony Peralta. This piece is part of Tony’s series entitled ROLOS & ICONS, which features a range of notable Latinas wearing hair rollers. It’s a thoughtful, clever and humorous twist on Warhol’s iconic silkscreen portraits; Tony uses the technique to celebrate a broad and diverse spectrum of Latino women and to elevate an everyday act—getting your hair done at the salon—to high art. 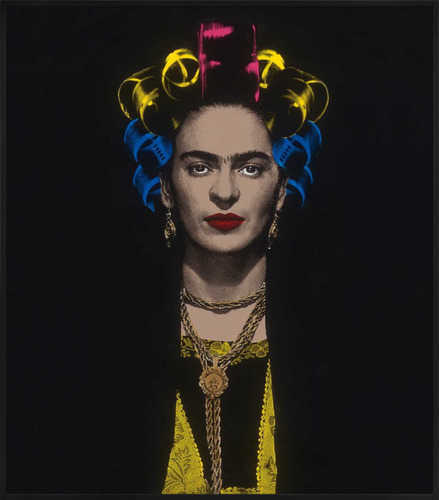 This work shows Frida Kahlo, arguably the most famous Latino artists and one who has been influential to Tony’s career.